Peace & Chaos is made up of 2 individuals, Nefeli Allan & Dimitris Pantazis, a combination of opposite energies which unite and form a unity of balance. Dimitri & Nefeli started Peace & Chaos completely on their own with small steps and big passion. From the first collection the ball started rolling and they are now in boutiques all over Greece & Cyprus. Peace & Chaos are constantly evolving, always inspired by print as this is where their expertise, speciality and passion lay. Keeping up to date with the freshest trends and they always have a boho sharp, wild child twist to their style. Our studio has undertaken the manufacture of Peace & Chaos eshop. 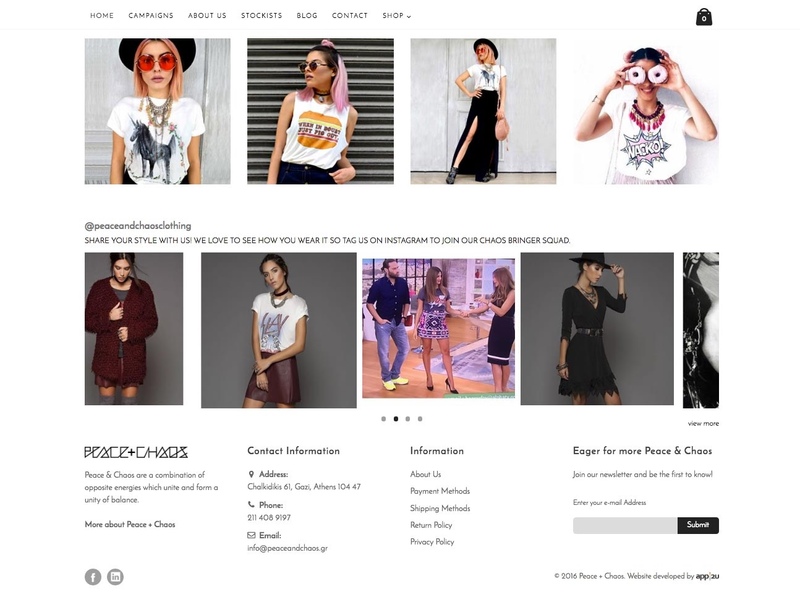 The aim was to create an online store that reflects the values ​​and characteristics of Peace & Chaos and at the same time ensures customers optimal user experience and security in online transactions. So based on Magento platform we have developed an eshop with all the features and functions that will make shopping easy, fast and secure. Moreover, the eShop has a “Stockists” feature which enable users to find stores near their location, by adding their address. Lastly, a remarkable highlight is the way of presenting each year’s Campaigns by using fully customizable photo grids.